The entries have been meticulously tallied, we have reviewed the rules with "legal," and after our team of experts has reviewed all of the responses we received to our "Guess the Aging Boomers" contest from last week, we have a winner. Edison Research's Larry Rosin had the most correct guesses, missing only seven (and we'll write some of them off to a less-than-clear photo). Larry's $25 Starbucks card is in the mail. And as you peruse this list of famous names and faces, bear in mind that they are out of radio's "sweet spot" target demo. These are the types of people radio is trying to avoid, as the industry attempts to keep stations solidly below age 50 in appeal. Now, of course, this is a rarefied list of celebrities and big shooters (present company excluded), but their inclusion in our "Sgt. 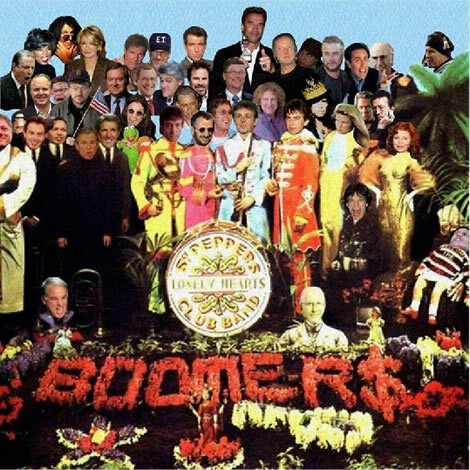 Boomer's" photo tells you something about how radio - and the advertising industry in general - is missing the boat on movers, shakers, and spenders.